Motorcycle wheels are made to cope with radial and axial forces. They also provide a way of mounting other critical components such as the brakes, final drive and suspension. Wheels, and anything directly connected to them, are considered to be unsprung mass. Traditionally motorcycles used wire-spoked wheels with inner tubes and pneumatic tyres. Although cast wheels were first used on a motorcycle in 1927, it would not be until the 1970s that mainstream manufacturers would start to introduce cast wheels on their roadgoing motorcycles. Spoked wheels are usually made using steel spokes with steel or aluminium rims. Cast wheels are predominantly made from an aluminium-alloy, but can also be made from more-exotic materials, such as magnesium content alloy or carbon fibre. In April, 1922, Borrani started production of motorcycle wheels with an aluminium rim. By the late 2000s, a number of materials and designs in addition to traditional spoked wheels were available, including cast, spun or forged aluminum; cast or forged magnesium; and single-layup or composite carbon fiber. High-performance motorcycles began to use cast alloy wheels (usually aluminum but sometimes magnesium) as early as the Münch Mammoth, with its single cast-elektron rear wheel which was shown at the Intermot motorcycle show at Cologne in late 1966. Elliott Morris began producing seven-spoke cast magnesium racing wheels in 1973. In November 1974 the Van Veen was exhibited at the Cologne motorcycle show with front and rear cast wheels and triple Brembo disc brakes for their 1975 Model Year rotary-engined OCR1000 machines. Aftermarket cast wheels for Japanese makes having drum rear and front disc brakes were available in UK from late 1974. A patent for a cast alloy motorcycle wheel was filed in 1974 and assigned to Carroll Shelby's Shelby-Dowd Industries; and in early 1975 Thomas J. Lester of then-named Lester Tire Company had applied for a patent on composite cast motorcycle wheel construction (with a press-fit hub). By mid 1975, Shelby-Dowd aftermarket cast alloy wheels were advertised for sale. In November 1975, Harley-Davidson, Moto Guzzi and Ducati all showed factory models fitted with alloy wheels at the EICMA show in Milan. By 1976, two more manufacturers were offering aftermarket cast aluminum wheels: Henry Abe of Osaka, Japan (now Daytona Global); and Lester Industries of Ohio (now a division of ITT). In 1975, the Moto Guzzi 850 Le Mans and the MV Agusta 750 America were available with alloy wheels as an option. Italian manufacturer Fantic produce a step-through moped named 'Roma' with 10 in (250 mm) cast wheels as standard specification in 1975. The Yamaha RD400C sold in 1976 was the first motorcycle by a major manufacturer to be fitted with cast wheels. The cast wheels weighed 100 grams (3.5 oz) more than the spoked wheels fitted to its RD350 predecessor. Honda began offering their Comstar composite wheels in 1977, marking the first time a manufacturer had included tubeless tires on a production motorcycle. At the same time as Honda's Comstar, Dawson Harmsworth firm in Sheffield, England produced a similar composite wheel from 1977 with generally comparable appearance, materials and construction. Initially intended for road racing applications, the wheel was specified for some models in the early 1980s Hesketh low-volume production road motorcycle range. Twenty years after the original business closed, the wheel is again being manufactured by a new business established by a former employee of Dawson Harmsworth. The advantages of the cast wheels versus spoked are several, and include the use of tubeless tires for higher speed and better retention of inflation; better runout tolerance and the elimination of spoke maintenance; better rigidity and thus better handling; weight reduction due to smaller hub size; and better handling of side loads for motorcycles with sidecar rigs. 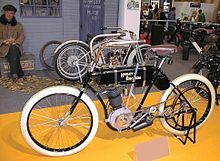 Early motorcycles used brake mechanisms such as spoon brake independent of the wheels, but modern machines use drum or disc brakes integrated with the wheels. In a bid to improve wet weather braking performance, Honda fitted inboard brakes to models such as the VF400F and CBX500F. This saw the front brake assembly enclosed in a vented aluminium hub to keep the brake assembly dry. Buell Motorcycle Company introduced a rim-mounted "zero torsional load" disc brake that was claimed to reduce unsprung weight in the wheel-brake system, including lighter wheel spokes that carried no braking load. 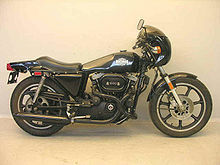 This style is generically termed a "perimeter brake" for its point of attachment to the wheel, and had been used in smaller numbers by other manufacturers before Buell. They can rarely be found on custom motorcycle spoked wheels. Exotic wheel technologies like hub-center steering and the centreless wheel have not gained wide adoption. ^ John Glimmerveen. "Classic motorcycles: Motorcycle wheels". about.com. Retrieved 2015-06-03. ^ "History of Borrani motorcycle wheels". Borrani Americas. Retrieved 2015-06-03. ^ de Cet, Mirco (2002). The illustrated directory of motorcycles. MotorBooks/MBI Publishing Company. p. 72. ISBN 978-0-7603-1417-3. ^ Peter Henshaw (15 Apr 2008). BMW GS: The Essential Buyer's Guide. Veloce Publishing Ltd.
^ "Cycle World Road Test". Cycle World: 36. March 1976. Retrieved 2015-06-19. Wikimedia Commons has media related to Motorcycle wheels. This page was last edited on 20 March 2019, at 18:48 (UTC).